Thinly slice then finely chop the shallots, garlic and ginger. Now finely chop the chilli, including the seeds. This amount of chilli gives a spicy but not too fiery kick to the chicken satay, but discard the seeds if you don’t like the heat. Heat the oil in a frying pan over a low heat. Add the shallots, garlic, ginger and chillies and fry for 1-2 minutes just to soften. Pour in a couple of tablespoons of water to soften, then stir in the spices (and freeze-dried lime leaves, if using) and fry for a minute. Remove the pan from the heat, let the mixture cool down, then blend to a paste with a pestle and mortar, using an up-and-down motion with the pestle. It will take several minutes to make a soft paste. Mix the spice paste, the coconut and, if using, the shredded fresh lime leaves with the minced chicken. Season with salt. Break off pieces of the mixture the size of a large walnut. For each, flatten into a round and lay a lemongrass stalk or wooden skewer in the centre. Mould around the bulbous end of the stalk (or skewer), working it so it goes about 8cm up it. Rough up the surface a little with your fingers so that the meat is not completely smooth and has some texture, then set aside while you shape the rest of the skewers. Brush each skewer with extra oil. 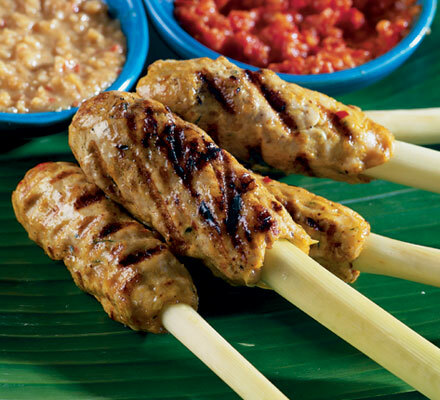 Cook the skewers on a preheated BBQ, griddle pan or grill for 8-10 minutes, turning several times. Serve on banana leaves. What a great summer recipe, and I love using peanut butter as an ingredient. Plus, more beautiful pictures! I wish you would come photograph my dishes 🙂 We love chicken satay and like you, I have experimented with many different peanut sauces and the one we like best is just about identical to yours. Love it!